Situated on the banks of the Thames, the old palace lets you explore more than 400 years of history. Originally Hampton Court Palace was a Manor built by Cardinal Wolsey, Chief Minister and one of King Henry VIII’s favourites. For political reasons, he gave the house to the King. Until 1540, Henry VIII rebuilt and expanded the Manor, which quickly became one of the most beautiful palaces of England. A large number of events and royal dramas proceeded in this palace and the many Monarchs, who lived here left their own prints on the Palace. 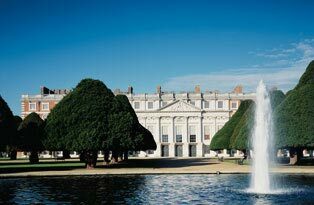 At Hampton Court Palace, you have the possibility to revive the history! By visiting the Palace, you will be able to admire examples of sumptuous decoration and furniture, which will give you an unforgettable impression of the lifestyle of the time. Experience the guides re-enacting Henry VIII’s wedding, visit Henry VIII’s State or the Great Hall. In the Tudor Kitchens, you will have the feeling that a feast is being prepared; wood fires are lighted, cauldrons are bubbling… See all the food and kitchen utensils used at that time to cook. 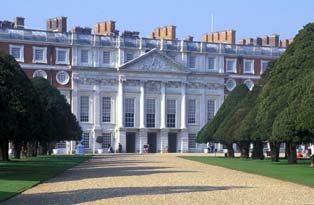 Rumour has it that Hampton Court Palace is haunted! On 23 December, 2003, video monitoring showed a door opening and closing on its own accord. Some people recognized the silhouette seen there as being Henry VIII’s ghost! It is also said that the ghost of Catherine Howard, fourth woman of the sovereign, condemned for adultery, haunts the palace. Discover for yourself and take your kids on the exciting Ghost Tour! After your visit of the palace, unwind while you stroll through the splendid gardens surrounding the palace. With an area covering 60 acres, there is more than enough room for the giant maze and the beautiful gardens. Will you be able to find your way out?